Are racking repairs and replacements proving to be a time consuming and expensive problem? Well they don’t need to be. 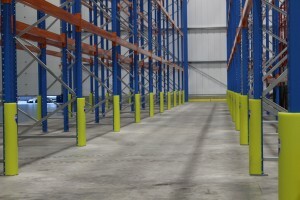 Racking is an important part for the smooth running of most businesses, yet it can often cause a majority of problems. When damage occurs to uprights it causes health and safety issues, rendering full aisles unusable, this causes order picking problems and delays which become passed down the business chain. These small problems which appear to only be internal can heavily effect the customer’s experience of your business as delays can be passed right down to them whilst the racking repairs take place. All of this just for a damaged upright in your warehouse. Rack Armour upright protectors are a great solution to the initial problem. The need for racking repairs can be severely reduced with the use of Rack Armour. The high visibility of Rack Armour in the first instance can be enough to keep FLT drivers from hitting uprights. 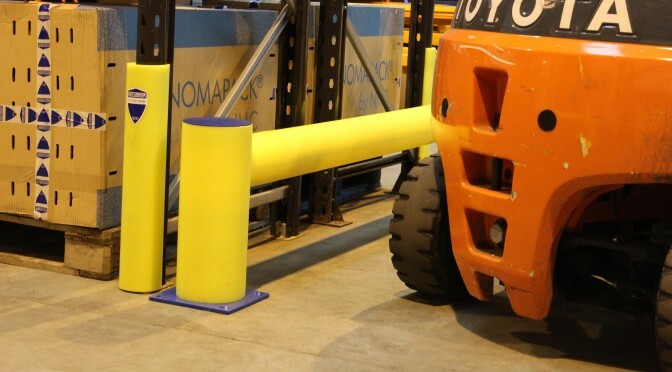 However, when impacts do occur, the ballistic grade plastic shell and foam interior of the Rack Armour upright protector form the best possible defence for your uprights. Did you know in the USA, on average one person is killed every three days in a forklift/ racking related accident. A workplace fatality can cost between 2 million and 5 million dollars! Rack Armour is proven to reduce warehouse damage by up to 80%, reducing the need to repair racking or even replace it. We aim to improve the safety of warehouses whilst also improving the way they operate by preventing disruption in the first place. Why not check out some of our videos or request a free sample? This way you can see for yourself how Rack Armour has become a worldwide selling product.